For those who lucked into Patrick Mahomes and James Conner, the may be but a foregone conclusion. But they're not the only two who have drastically changed fantasy football fortunes halfway through the season. The Midseason Goldies go to the real MVPs - the fantasy football players who somehow fell to the middle or bottom of the draft, if they were picked at all, and yet have dominated the league. If you've got two of these guys, there's a good chance you're in the top-3 of your league, no matter your early round picks (well, maybe not those who went Le'Veon-Gronk-Cook). If you've got three of them, you're on your way to a title. Here are the Gold Stars at the NFL's midway point. ## Quarterback ### Patrick Mahomes, Chiefs As if it could possibly be anyone else. The Chiefs are putting up ungodly numbers with Mahomes the second coming of Kurt Warner. This team has a very 1999-2000 Rams feel to it. I'm almost surprised they haven't signed Torry Holt. As if he could make Mahomes better. The second-year stud is shredding defenses, as he's on pace for 5,000 yards and 52 touchdowns. That's right - 26 touchdowns at the halfway point. And two rushing touchdowns, too. 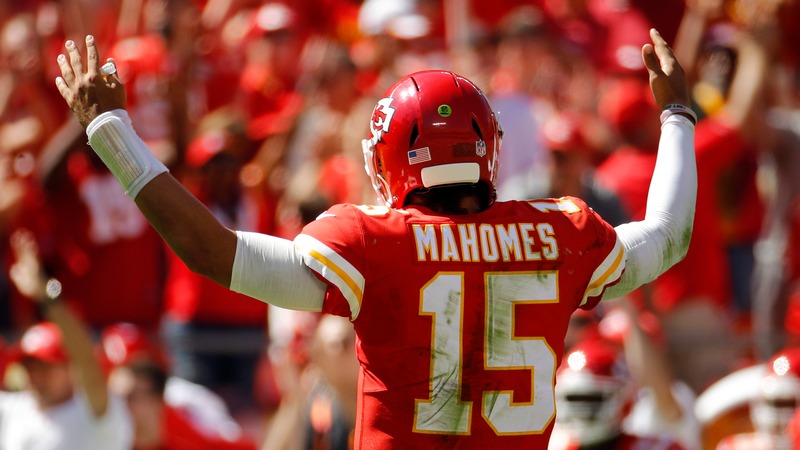 Would you trade Mahomes for any quarterback in fantasy right now? What about anyone not named Todd Gurley? ### Andrew Luck, Colts Somehow, Luck's return to form has gone almost underreported this year. Perhaps that's because of the Colts' 3-5 record, but did he draft and sign this atrocious defense? Luck has thrown for either three or four touchdowns in five straight weeks, and his arm looks better with the throw. After five interceptions in Weeks 5 and 6, he has seven touchdowns and no picks the last two weeks. After his bye, he has two meetings with the once-mighty Jaguars in the next four games, but his stretch run includes games against Dallas and the New York Giants, at home, in Weeks 15 and 16. __Honorable mention:__ Matt Ryan, who has not been quite as consistent as Mahomes or Luck, but has delivered four 30-point performances for the Falcons, including a 374-yard, five-touchdown day in Week 3; and Jared Goff, who has excelled for the Rams and ranks among league leaders with 2,425 yards and 17 touchdowns, despite a preseason QB17 ranking. __More fantasy:__ [Week 9 waiver wire targets](https://www.betchicago.com/waiver-wire-wish-list-week-9-fantasy-football) ## Running Back ### James Conner, Steelers Quite possibly the most valuable handcuff in fantasy football history, Conner could go down as one of the most intriguing stories in fantasy history, as well, when all is said and done. What happens when Le'Veon Bell comes back? Is Conner's value nil? Does he simply fade into the good night? All we know is his first seven games have been almost downright silly. Four 25-point games, three 30-point outbursts including two in the last three games, right when he appeared to be fading. For the year, he's up to 922 combined yards and nine touchdowns. He's put up high-level RB1 scoring as a likely waiver-wire or late-round selection. What a steal. ### Adrian Peterson, Washington Peterson, who only joined the squad once it was clear Derrius Guice was out for the season, has rediscovered his old ways, ranking fifth in the NFL with 587 rushing yards, while adding 151 receiving yards and five total touchdowns. Not bad for a guy who was on the scrap heap. ### James White, Patriots White has been what Christian McCaffrey was thought to have been, only more prolific. Who would you rather have today? And only a 160-or-so difference in preseason rankings. White has 380 receiving yards on 45 catches and has been Tom Brady's favorite red-zone target, catching six touchdowns. He's also added 189 rushing yards and a score on 40 carries. In PPR leagues, he's No. 2 in MVP voting behind Conner. __Honorable mention:__ T.J Yeldon, who has filled in admirably for Leonard Fournette with 660 total yards and five touchdowns with 37 receptions, even if he hasn't put up any huge performances; and Phillip Lindsay, who likewise hasn't gone off for the Broncos, but has hit for 9.5-plus points in ll but one game. A certain waiver-wire grab, Lindsay has far outplayed 4th/5th-round pick Royce Freeman and is a comfortable RB2 at this point. ## Wide Receiver ### Adam Thielen, Vikings Gold Stars are almost exclusively handed out to late-round picks or waiver-wire grabs, as those are the kinds of steals that can win you leagues. But Thielen's performances as the preseason No. 12 wideout has been remarkable, and he's on pace for some truly bonkers stats. Halfway through the year, the undrafted free agent is on pace for a ridiculous 148 catches, 1,850 yards and 12 touchdowns. He's caught at least six balls for at least 102 yards in every game, with touchdowns in the last five. Kirk Cousins loves him, and so should you. If you waited out the early Antonio Brown-DeAndre Hopkins-OBJ triumvirate and snagged a couple of running backs in the first two rounds (say, a Melvin Gordon in the first and a Kareem Hunt in the second), and took Thielen in the late-third, well, you're headed to a payday. ### Emmanuel Sanders, Broncos Really? Two Broncos on this list? Is there offense that good? Well, Lindsay and Sanders have been, relative to their draft cost. Where the running back position has been a mystery this year - Conner, White and Yeldon in the top-8? - the wideouts have stayed mostly true. Except, that is, for Sanders. The No. 6-scoring wideout in the game this year, Sanders is the only one in the top-10 who preseason rankings would dictate didn't belong. Projected as the No. 62 overall player, Sanders has 660 receiving yards on 50 catches with three touchdowns, plus 47 rushing yards and a score, and even a 28-yard touchdown toss. He's outscored the likes of Antonio Brown, A.J. Green and Mike Evans so far. ### Tyler Boyd, Bengals Boyd has blossomed for the Bengals, and not only become A.J. Green's best running mate, but a viable top-10 keeper at the position. Boyd has five WR1 games this year, with three 100-yard performances, a separate two-touchdown game, and a 91-yard, one-touchdown effort aside from that. In other words, he's been aces five of the seven weeks, and he probably was a free-agent acquisition. And you want volume? He has 66 targets to Green's 76. His owners will take that split. __Honorable mention:__ Robert Woods, who has been the best of the Rams' three-headed monster along with Brandin Cooks and Cooper Kupp and is on pace for 1,250 yards and six scores; and Desean Jackson, who seems to be getting better with age, or still has speed to burn for the Buccaneers after hauling in 26 passes for an absurd 594 yards and four touchdowns. ## Tight End ### Eric Ebron, Colts Ebron has been one of the few bright spots in a position that has fallen dramatically with Rob Gronkowski's disappearance. Ebron is finally delivering on his first-round potential after squandering his time in Detroit, as he's become Luck's preferred red-zone target with seven touchdowns. The yardage numbers are nothing to write home about, just 394 on 36 receptions, but a 14-touchdown pace is nothing to ignore. ### George Kittle, 49ers Despite the loss of Jimmy Garoppolo for the season, Kittle has performed well, topping 10 points in five games, with an average floor of about 60 yards. He's got only two touchdowns on the year, but his 584 yards rank third behind Zach Ertz and Travis Kelce. __Honorable Mention:__ O.J. Howard, who has between 54 and 72 yards in all but one game - and a 96-yard, one-touchdown performance in that one. He's got three scores on the year, and seems to be a favorite of both Jameis Winston and Ryan Fitzpatrick. He's only getting better from here.